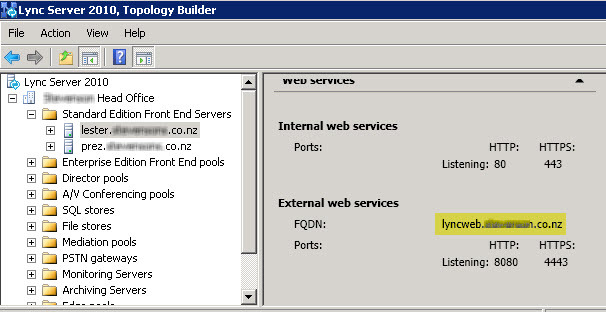 Usually the Lync Web Services certificate assigned to the Front-end Pool is issued by an internal CA. Of course this Root CA isn’t present on Mobile devices and so not trusted. The Lync mobile client would not be able to sign-in, unless the internal root certificate was pre-installed on the device. Its a little more tricky to deploy the Root CA to all your mobile devices so it makes more sense to NOT have a Lyncdiscoverinternal DNS record. Instead have a lyncdiscover A record (internally) pointing to the public IP of your RP. You will need a RP rule to allow this traffic from internal – effectively hairpinning the traffic. Even after configuring this I still got “Can’t verify certificate from the server. Please contact your support team”. It would appear that the devices dont trust the internal certificate which makes sense. So how to fix this? 2. the only way I could get around the cert issue was to create a new listner and assign it only 80. This did require an additional IP on the TMG internal. I did come across an environment that didn’t have the ability to add SRV records externally and were not using split brain DNS.